Statement Regarding Japanese Green Tea, the Fukushima Daiichi Nuclear Power Plant, and O-Cha.com. Because we operate our business with complete transparency, we provide the following information for our customers and the public at large. Our base of operations is in Iwaki city, located in the southern most part of Fukushima Prefecture bordering Ibaraki Prefecture. Green tea is not actually grown in or near Fukushima - it's too cold here. We use Iwaki as our base for our operations and purchase teas from various areas of central and southern Japan. From Iwaki, we ship to customers worldwide. O-Cha.com was greatly affected by the earthquake March 11th, 2011. Among other things, it demolished the interior of our office and destroyed 2 of our 3 main computers. We ceased selling tea on the day of the earthquake. Through numerous aftershocks we cleaned up, expecting to soon continue operations as usual. Unfortunately our office also happened to be located 37km south of the Fukushima Daiichi nuclear plant. While we were never close enough to be affected by a mandatory evacuation, due to prudent concern for our safety from the worsening situation at the time we decided to leave Fukushima temporarily. Temporarily turned into nearly one year. That was not because it was ever unsafe to live in Iwaki, but because of the false but understandable perceived fear many in the public had of anything associated with the word "Fukushima". Thus when it became apparent that fear of radiation would put a serious hamper on our business, we considered shutting down our long established site. However, we were offered the opportunity to re-establish in Uji Japan near Kyoto with the gracious help of the Tsuen tea shop located there. We moved there, re-established operations, and continued to ship from there through February 2012. When things settled down, we resumed operations in Iwaki Japan. First, it's where our office and warehouse is located, and it's also home. The radiation levels have never been significantly high in Iwaki. The average worldwide natural radiation levels throught the world are around 0.2 microsevierts per hour, close to the same level of radiation that exists naturally in Rome, Italy year round. Recent averages in New York City were 0.095, Singapore 0.09, 0.14 microsieverts in the Kowloon district of Hong Kong. If you were to fly from Frankfurt Germany to Singapore, you would receive 39 microsieverts of natural radiation just by sitting on the airplane. 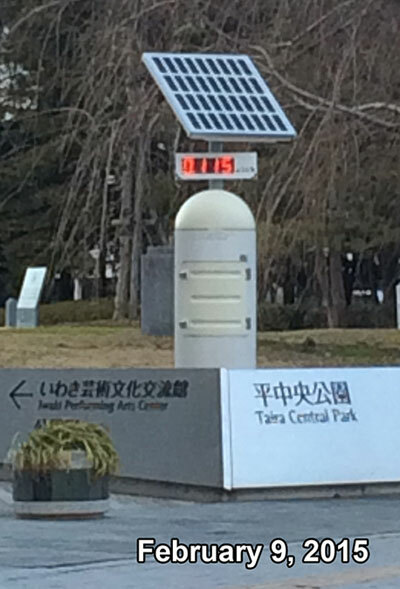 That is more than 200 times the amount of the current radiation levels in Iwaki near our office. Current daily measuring in the neighborhood of our office averages at 0.09-0.11 microsieverts per hour - an extremely low level. The radiation levels in Iwaki city are low, there is really no other way to say it. The type of radiation that was released from the nuclear accident is not the type that seeps through walls, packaging, boxes, etc. All of the green teas we have ever sold have been and continue to be grown and hermetically sealed in airtight packaging by our suppliers at the places where they are harvested - Southern or Central Japan. As mentioned earlier, green tea is not even grown in Fukushima. In no way has any of our teas ever been exposed to *any* level of radiation. Our teas have been tested out are AT OR NEAR ZERO becquerels per kilogram - they are completely safe. We resumed shipping from Iwaki again because the reality is there is no longer any real reason to be concerned with radiation levels here. We have had numerous persons purchase our tea independently who had them tested for radiation (without even telling us until after the results were in) and every time the results have be either zero, or near zero for radiation. It is an expensive proposition to have them tested correctly but we welcome you to do so if you have the means. All of that said, we realize there will be some who will nevertheless not want to buy our products out of a misplaced fear (known in Japanese as fūhyō-higai 風評被害 - damage based on rumor). We will continue to operate our business based on the facts, the primary being this: We personally consume all of our own products and would never sell any product that is contaminated by chemical, biological, or radiation - period. Aracha - Green tea leaves that have been picked, steamed, dried and rolled. Nearly all of the moisture has been removed. This is in contrast to freshly picked leaves, or dry leaves which have been infused. Seicha - Aracha which is further processed to take out the stems and subjected to the final roasting. This is the finished product. The standard of 100 bq/kg was chosen by the Japanese national government for dry leaf (aracha) over that of fresh leaf or infused tea. This standard was chosen (at opposition to some agricultural interests who preferred the lower readings of freshly harvest leaf) because when tea is contaminated by radiation, dry leaf shows the highest concentration of contamination and also because dry leaf is sometimes ground up for use as powdered green tea and consumed directly. When dry leaf green tea is infused with hot water, the concentration is reduced by about 10 times. Thus, the standard in Japan for infused green tea is 10 bq/kg (1/10th that of dry leaf). If one were to infuse this as normally is done when preparing green tea, any possible contamination would be also be reduced by 10. Please note that all of our green teas have measured out at less than 2 bq/kg (the limitation of testing equipment for cesium 134 being around 2 bq/kg) for dry leaf. The only area of concern for us regarding radiation in green tea we ever has was with Shizuoka tea, which, in some but not most areas of Shizuoka, fell above Japanese standards (but were still within International standards) for about a year after the Fukushima incident. We quit selling Shizuoka tea entirely for a year and a half. We later re-introduced Shizuoka tea again of a case by case basis, based on the facts and our assurance of its safety with certifications required. Last, but not least - If, after digesting all of the above information, you have any apprehension whatsoever that we would be willing live in a radioactive city, that we would throw away our high reputation built over 16 years and sell green tea to customers with harmful radiation in it, it would probably be in both your best interest and ours to find another source for green tea purchases.